Why Pokemon GO when you can STOP and SQUIRMISH? Author adminPosted on July 14, 2016 Categories News, SQUIRMISHLeave a comment on Why Pokemon GO when you can STOP and SQUIRMISH? 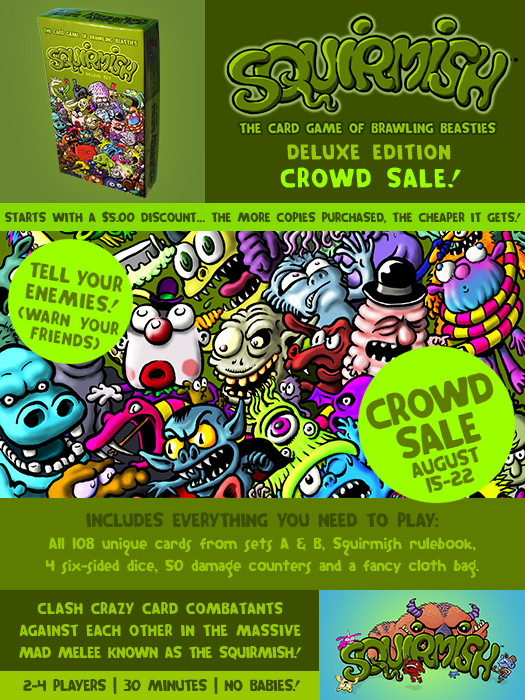 Author adminPosted on June 28, 2016 June 30, 2016 Categories News, SQUIRMISHLeave a comment on SQUIRMISH™: THE CARD GAME OF BRAWLING BEASTIES READY FOR BATTLE! 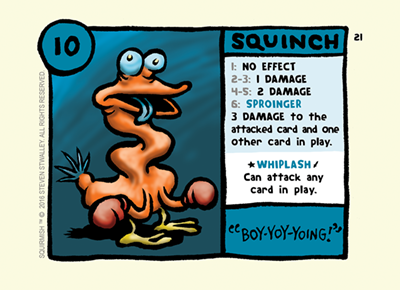 Squinch loves to fight, and it is a good thing, as it is all he is good at. While this plus-sized pugilistic pigeon wears boxing gloves to punch his opponents, he rarely uses them… he prefers to use his head to beat his opponents. That is not to say he outwits them… his IQ is lower than a snail’s bellybutton. He literally uses his head as a blunt instrument to beat his enemies with. His neck acts as a giant spine-spring, enabling him to attack from a distance… his whiplash ability lets him attack any card in play. If he rolls a 6 on his basic attack, his attack does three damage to the attacked card and another card in play! Unfortunately, using his skull for a club has left his brain completely addled. His skull is extra-thick and durable, leaving little room for brain to begin with… and the years of bopping his miniature-mind-matter around his brainpan has left it bruised, battered, and barely-functioning. It has left him able to do little beyond fighting. You would think that this would make him an easy opponent to beat… indeed, even his coordination has suffered, and he stumbles around dizzily. However, his head-hammer is quick and far-reaching, and only misses on a roll of one. This is a series of posts designed to help you learn a bit about some of the cards before you play the game. 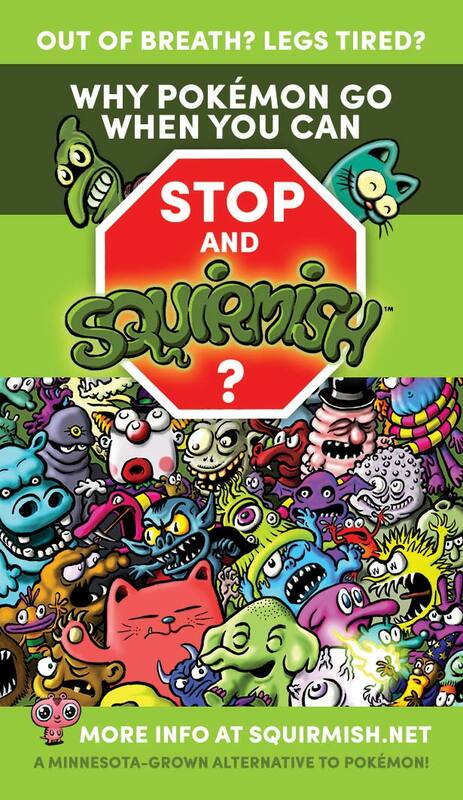 You can now buy copies of Squirmish here. Pompadoo, the cat with the pompadour hairdo, is a failed internet celebrity. Impressed by the popularity of Princess Monster Truck and Hipster Cat, Pompadoo figured his greasy pompadour hairdo would instantly land him fortune and fame. So far, it has only landed him a greasy hairdo, but he’ll keep trying. Pompadoo is a good fighter… he always lands some damage, regardless of the roll. 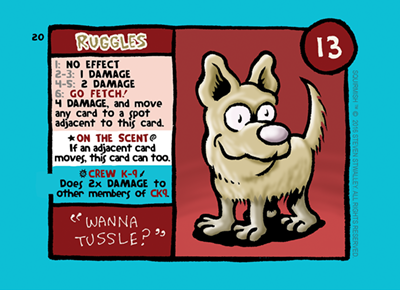 On 6, he does his cuddle claw, so smooth and gentle, his opponent’s don’t even know they just took 3 damage… and the attacked card can’t attack him on their next turn. Why would they? He didn’t do anything to them, right? And where is all this blood coming from? Like an excited kitty pouncing on a mouse or spot of laser light, Pompadoo loves a moving target. Using his catnip crazy special ability, he does +2 damage to any card that moved on its last turn. 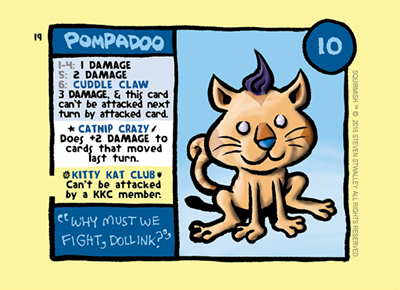 Pompadoo is another member of the Kitty Kat Club, and as such can not attack other members of said club. There is only one way to view things, and that is the way Uno Ojo sees things… as plain as the eye on his face. Uno Ojo always knows what is correct. All other viewpoints are wrong. Had Uno Ojo not decided to be a demon when he grew up, he certainly would have had a successful career in politics. Try to see things through Uno Ojo’s eye at your own peril. His tunnelvision does three damage to a card, and makes it so the attacked card must attack Uno Ojo on their next turn. Why would Uno Ojo want another card to attack him? Using his evil eye special ability, when attacked, Uno Ojo rolls a die… and on a 5 or 6, the attacker takes the damage from their own attack instead of Uno Ojo. 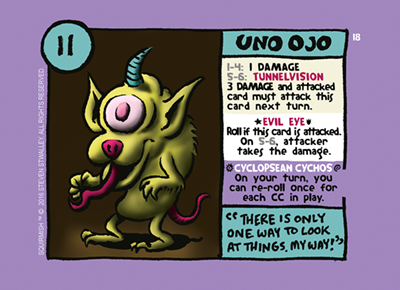 A member of The Cyclopsean Cychos, when his group is active, Uno Ojo can re-roll once for each member in play. Since his worst attack and special ability already happen on a 5 or a 6, this makes him very likely to succeed in using them when his group is active. 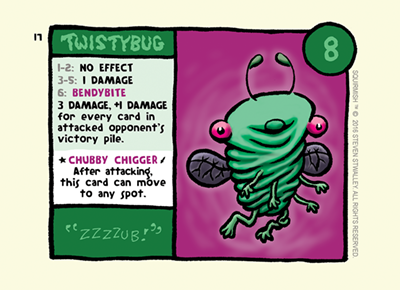 Twistybug is card number 17. Twistybug was just a regular insect until she discovered the once-popular dance craze the twist. Dancing to this, along with the mashed potato, the monkey and the funky chicken caused her to form her unusual exoskeleton (bugs, of course, have no spine with which to shake their buggy booties, so she had to make do without one). When Twistybug does her special ability Chubby Chigger after attacking, she twists away, moving to any spot in the Squirmish. Twistybug is just a little bug (with only 8 hitpoints)… but she has a nasty bite. Her bendybite does three damage, plus one damage for each card in the attacked opponent’s victory pile. Did you know mosquitoes, with their filthy, potty mouths, kill more people annually than sharks, alligators and bears combined? Well, Twistybug is not a mosquito, but she eats mosquitoes for breakfast, and has amassed quite the collection of mosquito-borne diseases in the process. Sure, she her bite carries the obvious ones, like malaria and west nile… but have you even heard of such rarities as the Saskatchewan Stomach Spewer and Leg-grow-from-your-head-itis? She carries them, and many, many more. And she never, ever brushes her teeth. Pooga is… Pooga… Pooga is AUH! AW! AH-CHOO! Oh, my allergies. 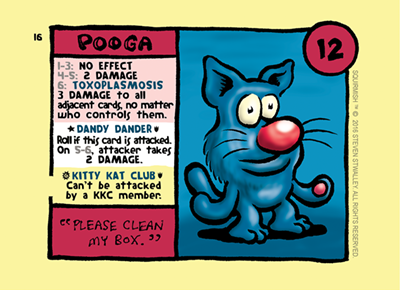 Pooga is just covered in allergens. When attacked, her “dandy dander” does 2 damage to the attacking card if they are allergic to her (which they are on a 5 or 6). This, combined with her 12 hitpoints, make her a pretty challenging card to knock out. Her attacks aren’t all that great… she only does damage half of the time. But if you roll a 6 on her basic attack, her toxoplasmosis does 3 damage to ALL adjacent cards (regardless of who controls them… yes, you can do damage to your own cards. You really might want to clean her box.). As a member of the Kitty Kat Club, she can not attack or be attacked by another member of the Kitty Kat Club. AH-CHOO! Augh. Do you have any tissues?